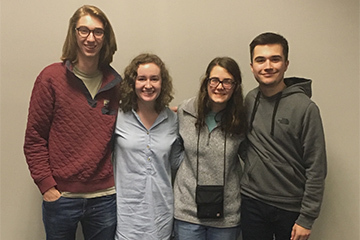 Four Samford University students flew from the Atlanta airport on Monday, Feb. 1, bound for Greece and a mission experience they all see as an opportunity of a lifetime. For three months, the Samford Global Missions Scholars will be among the first people that Syrian refugees meet when they disembark from their flimsy rafts onto the Greek island of Lesbos. The refugees are arriving by the thousands with almost nothing after crossing the Aegean Sea from Turkey on their way to a hoped-for better life in Northern Europe. “Our team has an incredible opportunity to love and serve these people in the name of Jesus in their most vulnerable and desperate situation,” said Lindsey Brodt, who expects to help distribute water, food, blankets and anything else that the refugees need. “From what we’ve heard, a lot of them just want someone to listen to their stories. We have the hope of Christ, and we are going to share that with those that we encounter,” said Brodt, a junior English major from Mandeville, Louisiana. The team from Samford also includes James Barker, Parker Millican and Morgan Ramsey. They are working through Greater European Mission, a nondenominational mission agency that is responding to the current humanitarian crisis in Greece by ministering to the physical and spiritual needs of refugees. Reports from a United Nations refugee agency indicate that as of December, 800,000 refugees had arrived in Greece during 2015. Most of them, possibly about 70 percent, were fleeing conflict in Syria. Others come from Afghanistan and Iraq. Lesbos, known principally as a tourist spot, is the point of entry before the refugees take a ship to the mainland. The students learned about the opportunity during a meeting led by Samford Minister to Students Renee Pitts last fall. As Global Mission Scholars, they have used their calling to global missions to participate in many summer and short-term mission efforts. Ramsey, for example, sees the Syrian refugee crisis as “something unique that God has handcrafted for this specific time, for a specific generation. “It is interesting that we as believers have prayed for opportunities to reach these people, and now God has removed the borders and given us this amazing chance to reach them and tell them about the Good News,” said Ramsey, who graduated in December with a degree in global studies. She has served five summers at a Christian camp in Ecuador, and has also done mission work in Guatemala, Mexico and Uganda. For Barker, a sophomore business major from Cleveland, Georgia, Greece has been a calling since high school. He worked with refugee men in Athens two years ago, and when the current situation came up, he couldn’t say no. Millican is also a veteran of numerous mission trips, including five two-week trips to Kenya, but this trip, which ends the end of April, will be his longest. It will be well worth the time, he believes. Except for Ramsey, the December graduate, each volunteer will miss a semester of school to assist the refugees. All say they plan to keep on their graduation schedule by taking extra courses in the summer or during a semester.